I’ve truly enjoyed Dan’s two former books Web Standards Solutions and Bulletproof Web Design . It was in fact from these books that I first learned the concepts of graceful degradation and progressive enhancement. I also learned clever CSS styling techniques that I’ve been using ever since. In this new book Dan introduces the concept of Progressive Enrichment. It’s an extension of Progressive Enhancement and in a nutshell it’s about being OK with that web designs will look slightly different in different web browsers. Furthermore it’s about not letting the smallest common denominator deciding which techniques to use but rather reward the more forward-thinking browsers with a slightly more polished look than the other ones (read Internet Explorer). What this means is that it’s OK to start using some CSS 3 properties like border-radius and RGBA right now even though they’re not yet widely adopted. If you’re still unsure about whether web sites have to look exactly the same in all browser or not, pay a visit at www.dowebsitesneedtolookexactlythesameineverybrowser.com. The book also contains some ideas on how to reuse CSS between projects. Sort of like building you own lightweight CSS framework like Blueprint CSS and YAML. Dan explains the value of a global reset and some basic CSS rules that’s usable in every project. It’s a true joy to read Dans texts. The writing style is relaxed but still to the point. The examples are thoroughly explained but doesn’t feel verbose. There’s also a laid back humor in the texts that make them even more enjoyable. As you probably noticed that I’m a big fan of Dan’s writing and the truth is that I wish that I could write like that. He’s just awesome. This book features guest writer Ethan Marcotte who’s been writing a chapter about “The Fluid Grid”. Ethan is a renowned Web designer/developer from Airbag Industries. This chapter describes how to work with fluid grid-based designs. It contains both some history of grid-based design in print as well as techniques to incorporate them in a web design. 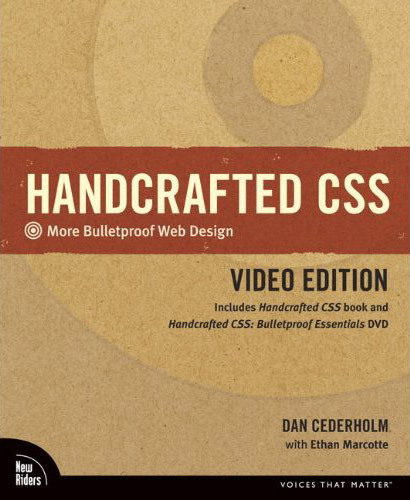 If you’re interested in starting to use CSS 3 in your designs I highly recommend this book. Not so much for that it’s chock full of exciting CSS 3 properties because it’s not, but rather because it introduces ways to start using them right now without breaking the designs in older browsers. Anyway you’re in for a great read. 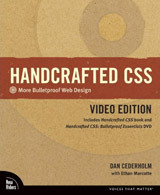 Read more about the book at it’s acompaning web site handcraftedcss.com. You can also read more from Dan Cederholm at his blog Simplebits.com.